Joyeux Noël! | Merry Christmas! Celebrating Christmas in the summer is still something I can’t get used to after so many years living in Australia. I love white Christmases and all the hearty Christmas foods that are so soothing to eat in the freezing winter. That being said, I absolutely love seafood and so being able to crack into a beautiful, fresh crayfish at Christmas Day lunch is something I relish. Luckily I don’t have to choose between re-creating the nostalgic feasts of my childhood Christmases and indulging in new summer festive food traditions because I always celebrate Christmas Eve French-style with my brother and his family, and then an Aussie Christmas Day lunch with my wife and hers. So today, I thought I’d share a perfect menu for both and maybe inspire you enough to share some of my favourite family dishes with yours this holiday season. Most French families will kick off any family meal with a delicious terrine or pâté. I posted a recipe for a great Huntsman Terrine a while back, which you can check out here, otherwise you can pick up a ready made slice from most good quality delis. 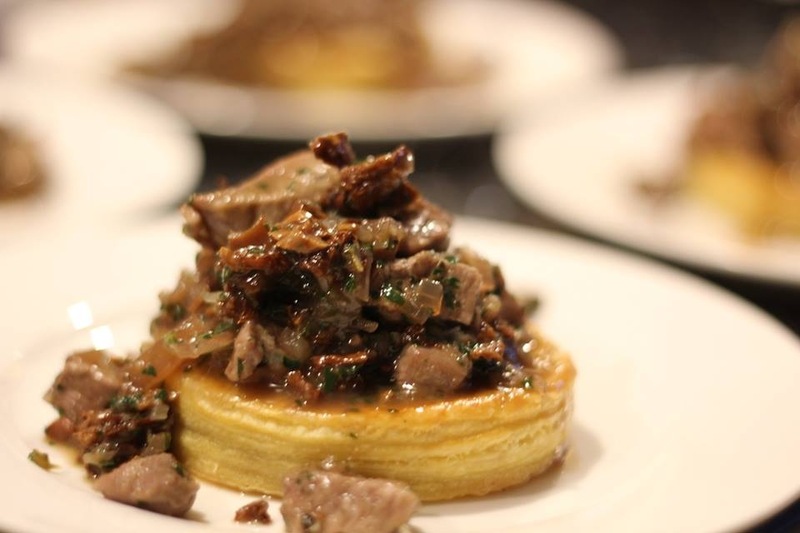 For Entrée, I’ve chosen a duck and mushroom vol au vent. The hero of this, aside from the light-as-air pastry, is the Girolle mushrooms (they’re called Chanterelles in Australia), which hail from my region in France and are delicious and meaty in texture. For main, I couldn’t go past a beautiful pork loin (with the skin on as crackling is a MUST!) that I’ve filled with a sage, pistachio and cherry stuffing, and a classic garden salad on the side. Lastly, a true French Christmas treat is a Bûche de Noël, which is a sponge, rolled with and covered in crème au beurre (Italian meringue whipped with butter). It’s super rich but there’s like nothing else. You can flavour them too, so I chose to do coconut, white chocolate and passionfruit. And there you have it. Joyeux Noël and bon appétit! Preheat the oven to 200 degrees Celsius (392 F). Take the pastry out of the fridge or the freezer (leave it warm up a bit if it’s directly from the freezer). Whisk the egg and the milk together to make an egg wash. Using a round pastry cutter cut the 4 vol au vent bases and place them on a flat baking tray lined with grease proof paper. Cut 3 more circles for each one, then using a smaller cutter cut the middle out, so only the outside ring remain. Brush the base with the egg wash and place the ring on top, press down gently to make it stick and repeat the process until you have 3 layers on each Vol au Vent. Put them in the fridge for 15 minutes before baking them. Take the Vol au Vent out of the fridge, brush them with egg wash and bake for 15 minutes. Soak the mushroom in warm water for 10 minutes, then discard the water. In the mean time, grate the garlic, finely chop the shallots, wash and chop the parsley. Take the fat off the duck breast and dice them (about 1 ½ cm). Heat up a medium size shallow frying pan with olive oil on high heat. Cook the shallots, chanterelle mushroom and garlic in the pan for 2 minutes on high heat, tossing from time to time. Then add the duck and cook for about 3 minutes on high heat. Add the chopped parsley and stir. Add the port sauce and toss well so that all the ingredients mix together. Spoon the mix into the warm Vol au Vent and serve immediately. Finely dice the brown onion, grate the garlic and finely chop the thyme. Heat up a medium size saucepan with a little bit of olive oil. Add the onion, garlic and thyme and cook for 5 minutes on medium heat. Pour the port in the saucepan and reduce by half, then add the stock and reduce by half again. Mix a little bit of corn flour with water, enough to make a runny paste. Slowly add it to the sauce until you reach the desired consistency. Check seasoning and set aside.